The Royal Pride of Scotland tartan has been designed especially to mark the the Royal Wedding of HRH Prince William and Kate Middleton. The tartan has been woven by famous weavers Lochcarron, on behalf of McCalls Highlandwear, who own the Pride of Scotland range. 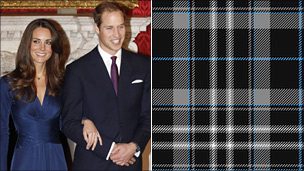 Described as "young, understated and strong", the Royal Pride of Scotland tartan consists of three shades of grey, with a vibrant royal blue overcheck, the inspiration for which came from Kate Middleton's engagement dress and the sapphire engagement ring, originally worn by Princess Diana. It's an exciting new tartan and similar in style to Highland Granite and other modern grey-based tartans. Pride of Scotland (Royal) Tartan Ribbon is available to buy in 10mm (3/8"), 16mm (5/8") and 25mm (1") widths on 25 metre (approx 27½ yard) reels and. The Pride of Scotland (Royal) Tartan Ribbon sold by tartan-ribbon.com is top quality, authentic Scottish tartan ribbon as certified by the Scottish Tartans Authority.